*** The PHOTOSYNTHESIS absorb the light with wavelength ranged in 380nm-760nm, among which the 610-720 nm and 400-510 nm are the absorption peak area. *** The 660nm deep red and 460nm blue LED light combination will give plant suitable growth light. The combination will visually produce pink light. *** The Blue wavelengths encourage vegetative growth and are essential in lighting for seedlings and young plants during the vegetative stage of their growth cycle, especially when “stretching” must be reduced or eliminated. It also stimulates the production of secondary pigments which can enhance colors and is known to also stimulate Terpene (i.e. fragrance) production. *** The Red light affects phytochrome reversibility and is the most important for flowering and fruiting regulation. These wavelengths encourage stem growth, flowering and fruit production, and chlorophyll production. The 660nm wavelength has a very strong photosynthetic action and also exhibits the highest action on red-absorbing phytochrome regulated germination, flowering, and other processes. Most effective for light cycle extension or night interruption to induce flowering of long-day plants or to prevent flowering of short-day plants. 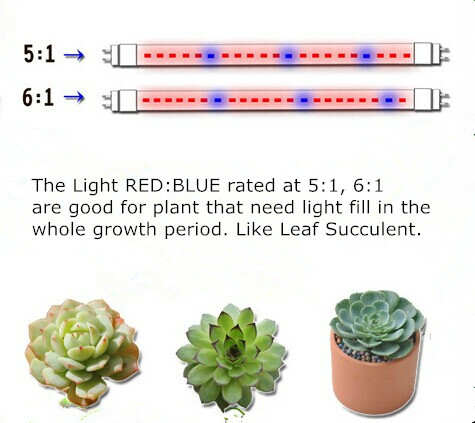 ***For different plants can adjust the RED: BLUE rate to get the most proper light for the plants. 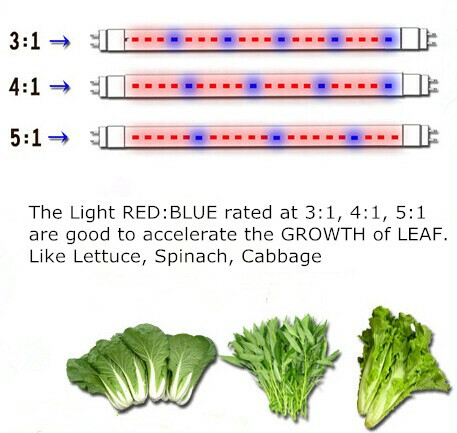 The light RED: BLUE rated at 3:1, 4:1, 5:1 are good to accelerate the growth of leaf, for plant-like Cabbage, Lettuce, Spinach and so on. The light RED: BLUE rated at 5:1, 6:1 is good for the plant that needs light fill in the whole growth period, like the Leaf Succulent. 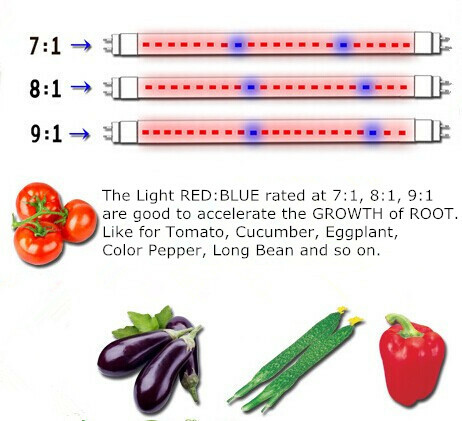 The light RED: BLUE rated at 7:1, 8:1, 9:1 are good to accelerate the growth of root, for plant-like Eggplant, Tomato, Long Bean, Color Pepper, Cucumber and so on.